Navigation: Home » Personal Finance » How Much Did You Save in 2012? How Much Did You Save in 2012? DQYDJ on the other hand, metes out the personal details slowly – because, well, you are not Cameron, Bryan or me. Decisions we make are generally good for our situations, and we do our best to explain how you should approach similar decisions. However, this is a site built on trust. So, once again, we open our books to our faithful readers so you can see if we’re (well, at least if PK is…) trustworthy enough to deserve your subscription. 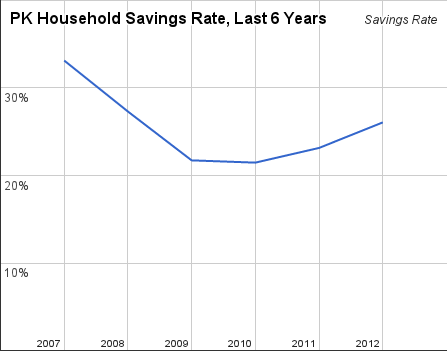 So that’s 26.07% net in 2012, using my definition of savings. Using your strict definition, I saved almost nothing because every time I have over $5K in the bank, I get anxious to invest in something you wouldn’t consider liquid (almost no stock market). I did buy 45 heads of cattle, a house cash, poured another bundle in building more house and improving the current one, that would bump the rate quite a bit. At least 60% if you consider it all. Yeah, it pains me not to include renovations and home equity gains – it’s just with savings I’m considering only the absolutely liquid (even stock in a retirement account you can get to in under a week). A more relaxed definition might be more useful, but with this one you can kind of see how your money is broken up (I do attempt to include principal reductions in my spreadsheet, but this is my top-line). I don’t put renovations but consider that I could easily get the price I paid for if I had to sell my house tomorrow. And it was paid cash, so before that, the cash was in savings, hard to consider it just disappeared. Yeah – I don’t account for any spending from savings (if it happens after the year ends – otherwise it nets out anyway, heh). And I have no doubt my renovations are worth something (they get the nod of approval from my wife – and she’s an Interior Designer, so I feel like I have something here). May savings rate was around 25% last year. This year it should be above 50% (thank you new job). 2x? Tough to argue with those results, haha. Hope the new job is as awesome as it is lucrative. 78.63% in 2012 using the same definition as you (but I’m probably 20 years older so it’s logical that it’s higher). 78.63% using the strict definition? That’s impressive at any age… could be over 100% if you relax the definition a bit, heh. You’ve got my respect and admiration. Oh, I don’t think it’s such a huge accomplishment. Someone saving 10-20% on an income of $25k/year is more impressive since I can still live a middle class lifestyle w/vacations etc. at that rate where they have to really cut expenses. Over 40% of the bogleheads in this poll are saving >30% on gross. I guess there are two demographics here – bloggers, writers and people in the saving lifestyle (I’d include people of forums, article commenters, etc. here – people who have been around a bit) and then… everyone else. In the former, you’ll probably always find someone with a higher rate in some area… but in the latter? Numbers are hard to come by, but keep an eye out for my take on the recently release CEX numbers. That’ll be my next piece in that series, after the food and sin taxes, heh. And yes, I haven’t built the calculator yet, but more income means more savings. nice – you put me to shame at 68% or so last year, and beat my goal of 75% this one. Do you already have a paid-off residence? Similar to Pauline, there was a much smaller amount of our capital that went into liquid investments than into less liquid ones. So I tend to look at it like this: We took home about $184K in taxable income, spent $37K on FICA and income taxes, spent $55K on everyday living expenses (mortgage included), and the rest went to 401Ks, IRAs, paying down some of the leverage on our investment properties, and rebuilding a cash buffer. Paying down leverage on our investment properties probably wouldn’t count as savings under your definition, but we look at it as finishing an investment we started a year or two before. … All of that means my definition is a strict one. Living in the Bay Area, it pains me to not include equity gains (especially those I forced by renovating rooms, which cost quite a bit, heh). This year we’re on track to save more – 35.68% my way, or 25.07% using your gorilla math. On home equity – I know it’s there, I just hate pointing at a value. I know my house is worth more than when I bought it (fixer upper mostly fixed in the Bay Area), but I still don’t count the principal pay-down in this accounting anyway. Using a relaxed definition I did a lot better. I’m not really talking about home equity though. I’m saying if you have $2,000 left over after all your bills and expenses are paid, that’s your savings rate. For me, some of that goes toward extra mortgage payments, some goes to my RRSP, some goes to my TFSA and some just sits in a savings account. … Although 2013 may be a bust in this regard. 2) Most of the third hand knowledge I have is… well, about scary overvaluations. So, Crack Shack or Mansion? I don’t like to disclose actual numbers for a lot of my own personal finances. I’ll generalize the numbers, talk in percentages or gains but I dislike the idea of opening up the kimono and reveling net worth, income etc. I do try to save a minimum of 15%, i would like it to be more but as long as I’m paying off debt, I won’t save more than that. I hear you; my kimono might have a slit, but it’s not see through. Or the Chinese saying, “taoguang yanghui”… that’s the one I like. Unfortunately My saving rate is poorly low. Instead I believe (actually I am able to do that only) in grabbing my necessity first and then paying i later. I don’t know why it happens but at the end of the month my BB becomes nil. Our family saved about 21% of gross income, and this was tough!!! I’d like to get it higher this year. We plan on having kids in 2 years, so I’d like to sock away as much as possible now! What’s the goal? If you state it publicly, you’ve got abetter chance of hitting it… or something, haha.